As you may know, the topic of "Virtual Book Tours" is a topic of great interest in our community. Our authors are getting great exposure by taking their books on tours and our virtual assistants have refined their skills in this area and are helping a lot of authors to accomplish more. A Virtual Book Tour is where you take your book on tour, around the globe, without leaving home! This is a hot topic and a powerful strategy to add to your book marketing "bag of tricks". In fact, at the virtual summit this June, Sandra Beckwith will be presenting a workshop on Virtual Book Tours called, "No Need to Pack for a Virtual Book Tour!" to host the virtual blog tour there is a lot of excitement. "The Digital Publishing Virtual Summit!" This year we are offering the ability for you to Listen in Live at no-cost! surprises.Take a peek, I believe you'll be glad you did. this aspect of the event. This year our topic focuses on "digital publishing". You'll have the opportunity to listen in as 20 dynamic speakers share their knowledge in the area of developing, publishing, and marketing your digital content! Check Out the Workshops - in 4 Content Areas! * Erin Ferree: How I Went Viral With My eBook And You Can Too! Our events are always action packed and a lot of fun! questions, ideas, and "ah-has". enjoy! Here's to your book marketing success! As a book coach, I receive quite a few questions from my clients, blog readers, and social media followers. I decided to put together a list of some of the most common questions I receive about writing, publishing, and marketing non fiction books and ebooks. Q. Do I need my own book selling website? One new client asked this question. Her Amazon sales so low, as were her own site's sales, that she realized she needed to create a new URL for her Romance Book website, using the title as part of the name of the site. Also, her new site would have the advantage of collecting her unique visitors' emails (opt-ins) so she can stay in touch and promote on a regular schedule such as 1X every two weeks. Your audience will appreciate your free samples and keep listening to you. With the constant addition of fresh material, you make the search engines happy with your site. With our email list of website subscribers, we are able to let my audience know about upcoming teleseminars and book coaching opportunities as well as special new information they want. We built my list of 3000 opt-in into over 6000 which makes great opportunities for other sales. Check out this handful of website tips to help you sell more books. Q. What is the best way to go about getting my work copyrighted? I have heard several stories. One story is that all I have to do is draw a C and put a circle around it. Another story is that I have to go to a lawyer. Please tell me the real story. A. It's not enough to put a copyright sign on the page. You also need to use the word "Copyright," because some countries don t recognize the "C" symbol. If you want to do even more, send a copy of your manuscript to the copyright office in Washington, DC. It costs under $50 and protects you if you ever have to go to court. Q. What's a Great title and what's a Bad title for an ebook? A. A good title is one that connects with your potential buyers. It does so on an emotional level and gets them to take the next step and look at the table of contents and/or purchase the ebook. A bad title is one that doesn't convey what the ebook is about. It can also be just plain dull-sounding like a textbook. Or it can use words that are hard for people to connect to, pronounce, or understand. Discover how to write the best titles for your ebook and more! Q. How do I know if my book is significant enough, if people will need it? A. Use my significance test! Over the years perfectly competent people with unique information to share in a book have come to me, so afraid their book isn't good enough, their peers will judge it as poor, or they won't be able to get it out to their audience. Is it filled with action if fiction? Is it exciting? Is it fun to read? Have humor? Does it present useful, original and unique information? Does it have potential to positively affect the reader's life? Is the message said in a unique way? Does it brand you or your business? Does it answer an age-old question such as the meaning of life? Does it create a deeper understanding of human nature? Does it give skills and information to help individuals? Will the particular audience want or need its information? One for an article or blog post. Three for a top seller. Five for a Pulitzer Prize. Six for a literary classic. These are just some ways for you to build your confidence and courage to share your word with the world. So be encouraged and start writing! I'd love to hear your personal questions! I want this to be an ongoing Q&A, so please feel free to participate! One opportunity a day keeps success coming your way. DigiMogul is a new media company and social blogging platform. With over 12.8 million visitors each month and 86 million page views, the company is in search of talented and enthusiastic new contributors for Do More Act Now, a social political platform for individuals and activists to stay informed about vital issues that matter to them. Do More Act Now is seeking independent bloggers who are well-informed on the latest news, local and national social/political issues, and have an in-depth knowledge of pop culture and how to utilize social media. They are looking for people with journalism, writing and blogging experience. 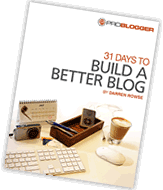 Bloggers will be expected to post a minimum of 10 articles a week (2 a day) and promote their work daily. Beginning pay is $500 a month. There may be incentives and growth opportunity for writers whose content performs well. How valuable is this opportunity? 1 = not at all; 10 = I'm taking advantage of this opportunity today! Got any inspiring words? Share them with us and we may include them in an upcoming issue of The Create Daily. Share your inspiration. Q: How do you use storytelling in your work? Post your answer on our Facebook Page or via Twitter using hashtag: #createdaily. Are you a part of our social networks? We talk even more opportunity goodness - jobs, resources, inspiration and more! The Create Daily is a daily resource for creators. Our mission is simple: arm creators with hand-picked opportunities to help grow your career. Copyright (C) 2012 The Create Daily All rights reserved. You might recall that I mentioned in the May 9 issue that my "baby" was graduating from Xavier University on May 12. It was a wonderful (and mercifully brief) event that ended with confetti shot to the ceiling from the front of the stage - a fun surprise! Don't you love these milestone events? Remember to subscribe to the blog via e-mail or RSS feed using the options on the right side of any blog posting so you don't miss anything that might help your book promotion campaign. In the May 9 issue, we talked about how to capitalize on a range of annual spring occasions, including college and high school graduations, Mother's and Father's Day, and bridal and baby showers. I hope you gave some thought to how you could use one of them to promote your book. In this issue, we've got that occasional list of quirky, offbeat, or interesting holidays for the upcoming month. Can you link your book to one of them and use it to draw attention to your book? Get the complete list of goofy June holidays online at this link and have fun brainstorming about how to use them to promote your book. I was on the "How to Be Your Own Book Publicist" panel with Penny Sansevieri and Marsha Friedman at the American Society of Journalists and Authors (ASJA) conference last spring; I've uploaded our PowerPoint file to SlideShare in case it's helpful to some of you. Here's the link: http://slidesha.re/z3iiHL. Are you ready to learn how to get the word out about your book? It's time to register for the next "Book Publicity 101: How to Build Book Buzz" e-course running online from June 4 to 29, 2012. Both sections - one for traditionally published authors and the other for those who have self published - emphasize the planning, strategy, tools and tactics needed to get - and keep - your book in the news so that you sell more books. (The course for self-published authors includes a section on how to announce a book's publication and generate reviews.) You'll leave the class with your own book publicity blueprint, tools you can use immediately to get media exposure, and a solid understanding of how to get attention in both traditional and social media worlds. The class is taught online in a forum format. There are no scheduled meetings or sessions - you work at your own pace according to your own schedule. I provide very personalized guidance and feedback as you move through the course. For details on the original course, "Book Publicity 101: How to Build Book Buzz," go to http://buildbookbuzz.com/how-to-build-book-buzz-workshop/. For specifics on the self-published authors course, "Book Publicity 101 for Self-Published Authors: How to Build Book Buzz," go to http://buildbookbuzz.com/self-published-how-to-build-book-buzz-workshop/. I'm getting lots of requests for information on how to get paid to speak, so if you're one of those authors who wants to learn more about this, check out this blog post, "Authors and Public Speaking: 5 Reasons to Be an Author Who Speaks." It includes a link to a super-affordable two-part audio program with lots of helpful information. Pyramid Solitaire Saga - The new Solitaire Game! Play now. Warning: Highly Addictive! Play Now · 2,600,000 people played this. Play naughty. Spin nice. Play Zynga Slingo for FREE now. 15,900,000 people played Zynga Slingo. Play the most addicting Hidden Object Game on Facebook! 5,100,000 people played DoubleDown Casino. Email Marketing, eNewsletters, RSS Surveys, Autoresponders. Free Trial! Leap fireballs, dodge dragon breath, and vault chasms in this acclaimed Facebook MMORPG! Play Now · 70,000 people played this. Free Entrepreneur Seminars in the Detroit Area - 5/29-6/2. Reserve Your Free Seat Now! 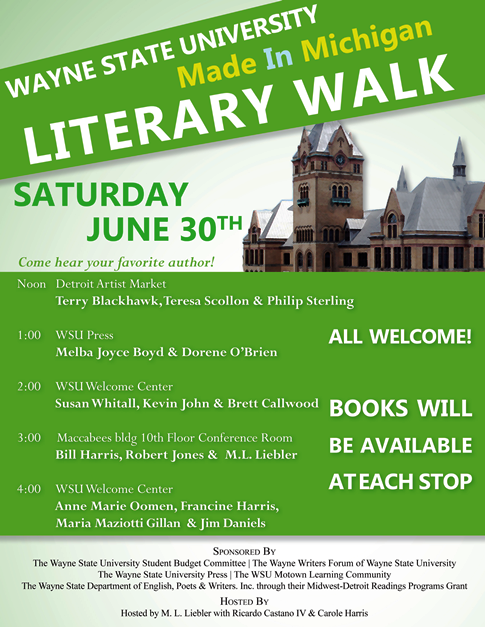 Join us for the inaugural Wayne State University Made in Michigan Literary Walk--a strolling afternoon of literature hosted by several venues in our Midtown neighborhood. A range of authors--from poets to rock 'n roll historians--will read from their latest work and books will be available for purchase and signing. Sponsored by Wayne State University Press, the WSU Student Budget Committee, the Wayne Writers Forum of WSU, the WSU Department of English, Poets & Writers. Inc. through their Midwest-Detroit Readings Programs Grant and the WSU Motown Learning Community.